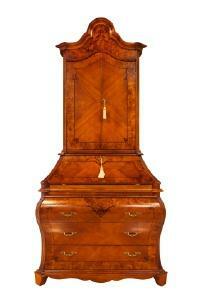 During the 19th century cabinet makers crafted exquisite pieces that are highly desired by antique collectors of today. Throughout the 19th century many different furniture styles came in and out of vogue. It was the century of revival furniture styles in the United States, England and Europe. As America became more industrialized, furniture reflected the new technologies of the times. Cabinet makers quickly adapted the styles of the furniture to the new technologies. The following are the furniture styles of the 19th century and the years the styles were produced. Knowing the years that the furniture styles were produced makes it easier to see the transitions that many cabinet makers of the 19th century made during their years of production. Although there were hundreds of cabinet makers using their skills throughout the 19th century, there are many that are considered true masters of their craft. Born in 1813, Alexander Roux was a French cabinet maker that worked in New York City. Although Roux produced pieces on his own, he also worked with his brother, Frederick Roux and his son Alexander J. Roux. Alexander Roux specialized in furniture of the Gothic, Renaissance and Rococo Revival styles. The Roux shop closed in 1898, twelve years after its founder, Alexander Roux passed away. An English cabinetmaker, Thomas Sheraton, lived from 1751 - 1806 and is most known for his exquisite neoclassical pieces. Aside form Chippendale, Thomas Sheraton is thought to be the most famous of the English cabinet makers. A cabinetmaker in North Carolina, John Swisegood was of German descent and brought a strong German influence to his pieces. He is considered by many to be the most well known furniture maker in the North Carolina area during the early to mid late 19th century. Swisegood is well known for his beautiful pieces and his fine work with inlays and veneers. Often surviving antique furniture pieces made by many of the 19th century cabinetmakers are part of private or museum collections.